St. Mary, which had been dedicated just one year before at N.W. Second Avenue and 75th Street, was elevated to the rank of a cathedral and was the scene of Bishop Carroll's formal installation on Oct. 7, 1958. Dade County commissioners deny a zoning request from the Diocese of Miami to build a new church and school – St. Thomas the Apostle – on a 12.5-acre tract in south Miami, on Hardee Drive near S.W. 74th Avenue. “Protests said neighborhood quiet would be disturbed,” according to the story in The Voice, the archdiocesan newspaper. 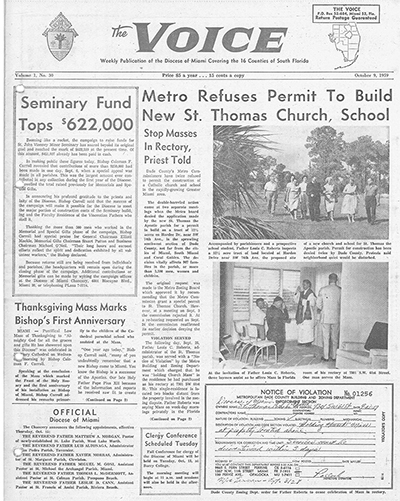 On the 15th anniversary of the Diocese of Miami in 1973, some 569,543 South Florida Catholics were served by 236 diocesan priests, 209 priests and Brothers of Religious Orders, and 749 Sisters. The Archdiocese had 120 parishes and four missions and had added to its roster of social services to the aged, two low-cost apartment complexes for persons on fixed incomes. Miami Auxiliary Bishop Rene Gracida is named founding bishop of the newly created Diocese of Pensacola-Tallahassee, Florida. On the 20th anniversary of the founding of the Diocese of Miami, the Catholic population numbered more than 770,000, served by 485 archdiocesan and religious order priests, 700 sisters, and 50 brothers. The archdiocese had 130 parishes in 8 South Florida counties as well as 62 elementary schools, 16 high schools and two special education schools. Senior citizens are served by three homes for the aged and three senior citizen housing projects with two more such projects on the drawing boards. Attendance at Mass increased significantly in the Archdiocese, according to figures released by the Chancellor's office. From October 1988 to October 1989, parishes counted an average of 20,000 more people at Mass, from 753,019 last year to 784,528 this year. 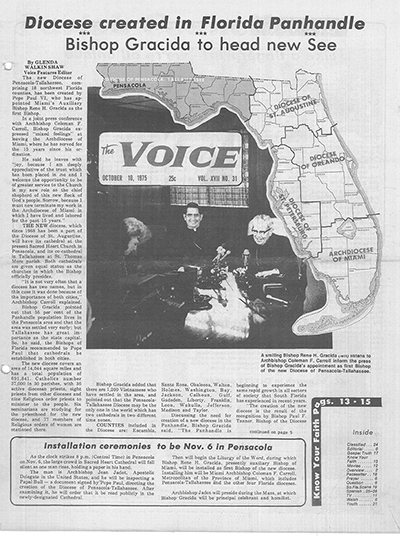 The Voice ends its 31-year run and publishes its last edition, dated Oct. 5. 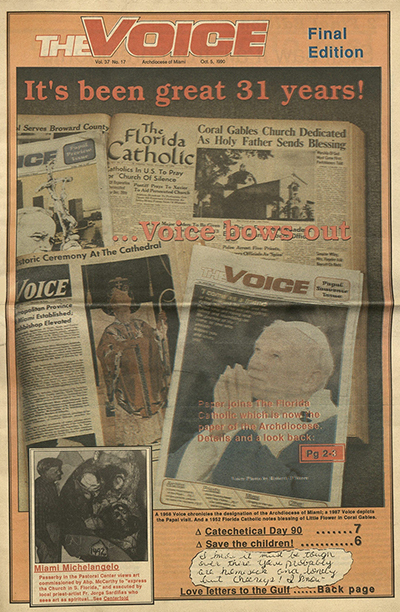 In November, it resumes publication as part of the statewide Florida Catholic newspaper. 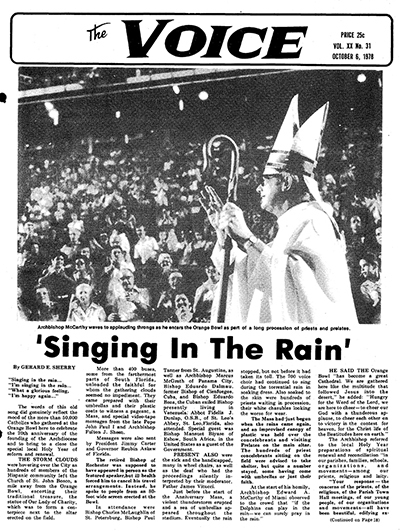 Barely two months after the passage of Hurricane Andrew, on October 7, the archdiocese marks its 34th anniversary in the midst of the destruction, celebrating the Mass not in Fort Lauderdale's Lockhart Stadium, as originally planned, but in an open field near St. Joaquim Parish in South Dade, with a tree stump for a pulpit and an altar made of hurricane debris. Archbishop Edward McCarthy, Auxiliary Bishop Agustin Roman, Father Tomas Marin, chancellor, and Father Thomas Wenski, director of Haitian Ministry, visit the Cuban and Haitian refugees indefinitely detained in Guantanamo. Upon their return, they decry the living conditions in the camps and call for the swift reunification of families, especially the prompt admission into the U.S. of the frail, elderly and unaccompanied minors. They also announce that priests from the archdiocese will volunteer to spend two weeks at a time in Guantanamo ministering to the refugees. 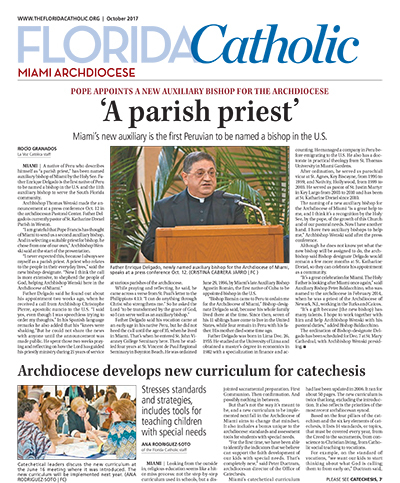 Calling it his "parting gift" to the people of South Florida, Archbishop McCarthy issues his 25th pastoral letter, titled "Priestly People: A Pastoral Letter on Prayer with Particular Attention to Contemplation and to Centering Prayer." In it, he calls for people to rediscover and practice daily prayer. Exiled Cubans respond overwhelmingly to a call for help from for their brothers and sisters on the island affected by torrential rains and flooding caused by Hurricane Lily. More than 250,000 pounds of rice, beans, canned milk, cereals, baby food and medicine collected in less than a week are shipped via Catholic Relief Services and delivered directly to Caritas Cuba, who would in turn distribute it directly to the needy. After obtaining the necessary permits from the U.S. government, a portion of the aid, the first installment of the aid shipments – about 72,000 pounds of powdered milk, rice and beans – reaches Cuba, accompanied by Father Thomas Wenski, archdiocesan director of Catholic Charities; Chris Gilson, Cuba director for CRS; and Father Thomas Kubala, pastor of St. Thomas the Apostle Church in South Miami. Distribution in Cuba is delayed more than a week because of Cuban government red tape. Officials objected to slogans which identified the donations as coming from Cuban exiles – “Pan, Amor y Libertad” (Bread, Love and Liberty); “Exilio” (Exile); “Por Cuba, el amor todo lo puede” (For Cuba, love conquers all) – deeming them political and forcing Caritas officials in Cuba to re-package the food stuffs or cook them before distributing them. Cuban officials also haggle with church representatives over whether the aid would be distributed to all who were in need on the island or just to hurricane victims, a point on which the Church would not budge. The negotiations delay the distribution of aid for nine days. 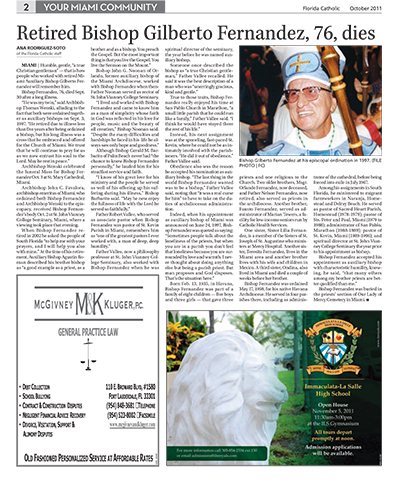 Retired Auxiliary Bishop Gilberto Fernandez is laid to rest at Our Lady of Mercy Cemetery in Doral after a Mass celebrated Oct. 3 at St. Mary Cathedral by retired Archbishop John C. Favalora and Bishop Fernandez’s episcopal twin,” Archbishop Thomas Wenski. Bishop Fernandez died Sept. 30 at age 76, after a long illness. Oct. 12: Father Enrique Delgado, pastor of St. Katharine Drexel in Weston, is appointed auxiliary bishop of the archdiocese. He is the 12th Miami priest to be named a bishop and the 10th auxiliary bishop appointed to serve in South Florida.